The Standing Rock Sioux battle to protect their sacred sites from being destroyed by a giant oil pipeline has just taken a shocking turn. 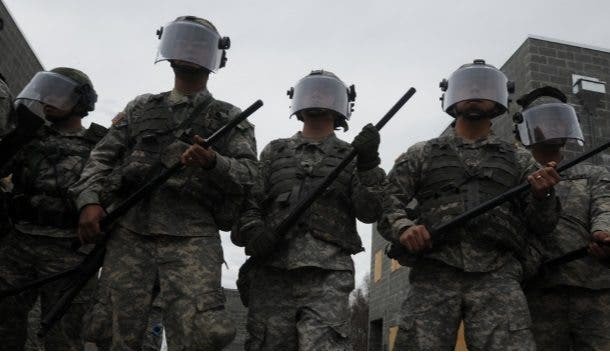 The Governor of North Dakota, Republican Jack Dalrymple has called in the National Guard to deal with the massive group of protesters that has congregated to stand up for the rights of Native Americans. Tensions are running very high between the private security forces hired by contractor Energy Transfer Partners and the protesters from over 200 Native American tribes from around the country. Corporate goons have already inflicted a swath of injuries on the protesters with their use of attack dogs over the weekend and police have arrested over 37 for such ridiculous charges as “preventing arrest,” “disorderly conduct,” and “trespassing” – but did nothing when the oilmen began bulldozing ancient burial sites before they had the proper paperwork to do so. A judge has issued an emergency restraining order until the formal hearing on the legality of the $3.8 billion pipeline, which spans four states and areas that the United States has ceded to local Native American tribes by treaty. But of course, as the United States government has done constantly during the past four hundred years, those treaties are being tossed aside in favor of fossil fuel profits. The imagery of Governor Dalrymple calling federal troops to deal with upstart Native Americans is all too poignant. “Because of the increased and prolonged need for law enforcement resources, I have asked General (Al) Dohrman to make available some North Dakota National Guard personnel to support law enforcement and augment their public safety efforts” said the Governor. It’s shocking to see in this day and age that violence and intimidation is still the automatic response of the government when it comes to responding to the legitimate demands of Native Americans, who are simply fighting desperately to stop the destruction of their heritage and preserve the cleanliness of local water sources. Our nation’s long history of genocide, abuse, and neglect towards the original inhabitants of this land is a dark stain on our history – and behavior like this makes it painfully clear we aren’t sorry.